Calendar that specializes in a monthly view. Is there a better alternative to Moca? Is Moca really the best app in Productivity category? Will Moca work good on macOS 10.13.4? 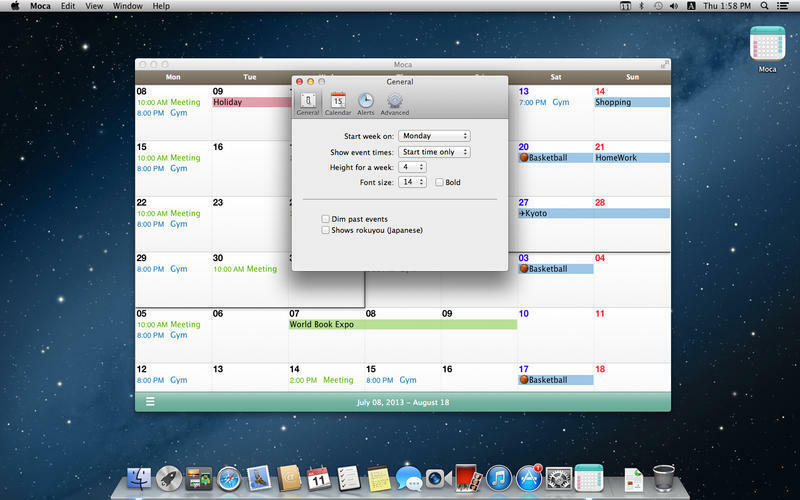 Moca is a beautiful and convenient calendar app that provides a great monthly view. Infinite longitudinal scrolling - Each of the month calendar is organized in a longitudinal direction and is easy to scroll up and down. This is absolutely useful for those who want to check the most recent schedule at once. The calendar is not divided by month so even in the end of the current month, you can view the schedule for the upcoming months efficiently. Moca needs a rating. Be the first to rate this app and get the discussion started! Recommended for people with less schedule - This app is particularly designed for the people who use the monthly calendar view. It may not be the best if your weekly schedule is full. Integrated with System calendar - The calendar loads data included in the built-in System calendar account. No need for configuring complicated settings. You can use GoogleCalendar or Apple iCloud calendar directly. System Preferences -> Mail, Contacts & Calendars. Quickly add event - Input natural sentence such as "Shopping on Saturday from 11am-1pm", you can create event by automatically set date, etc.